Barrel: Metal non-rifled (4.25 inches). Ammunition Capacity: 15 round metal stick magazine. 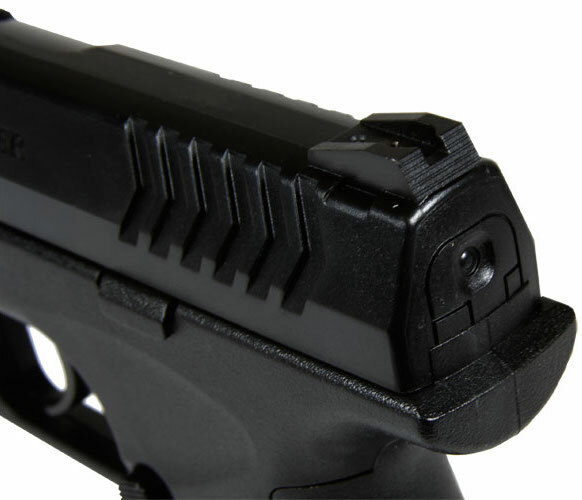 Trigger Pull: The trigger pull on the Umarex Combat Zone Enforcer CO2 Airsoft Pistol is medium to heavy but since it's a double action only trigger, this is to be expected. There is a fair amount of take up with the entire pull being about 8-9 pounds and the release point happening right at the very back of the pull, you get a bit of a clicking sound warning right before it releases. If you are used to shooting other lower priced double action triggered Airguns where the barrel protrudes out of the front of the gun when you pull the trigger, then you will know what to expect with the Umarex Combat Zone Enforcer CO2 Airsoft Pistol. Accuracy: This part of the review is yet to be determined as I have not done my Field Test or Shooting test. I have tested out the Umarex XBG in the 4.5mm Steel BB version and it shot really close to 400 fps and produced about 2 inch groupings on a target setup 30 feet away using 10 shots. Build Quality: The Umarex Combat Zone Enforcer CO2 Airsoft Pistol has pretty much all the mechanical parts moulded into the shell of the airgun with the exception of the Trigger, safety and magazine release. Again, most of the build materials are plastic with the exception of some internal parts, the magazines, the barrels and the triggers. This simplistic design does work well and since there are less moving parts there is less that can go wrong. Realism: The Umarex Combat Zone Enforcer CO2 Airsoft Pistol is not a licensed replica but sure looks a lot like the XDM 9mm 3.8 Compact. Of course since the Umarex Combat Zone Enforcer CO2 Airsoft Pistol is all plastic and has no blowback operation or a moving slide it won't fool anyone once they pick it up but form a slight mistaken it looks real enough. Available From: The Canada and US Replica Airgun Stores. Very low cost, around $50 bucks. Should have a nice combination of Shots per CO2 and FPS because of efficient design. Universal metal Stick magazine works in in a bunch of guns, can mix a and match. Constructions screws are less obvious (Smaller). Swing up CO2 door will not get lost. Not a lot of actual working parts except for the trigger and magazine release. All else is molded in to the plastic. Double action triggers are a bit longed and heavy. No adjustable sights or hop up adjustments so hopefully it shoots straight? 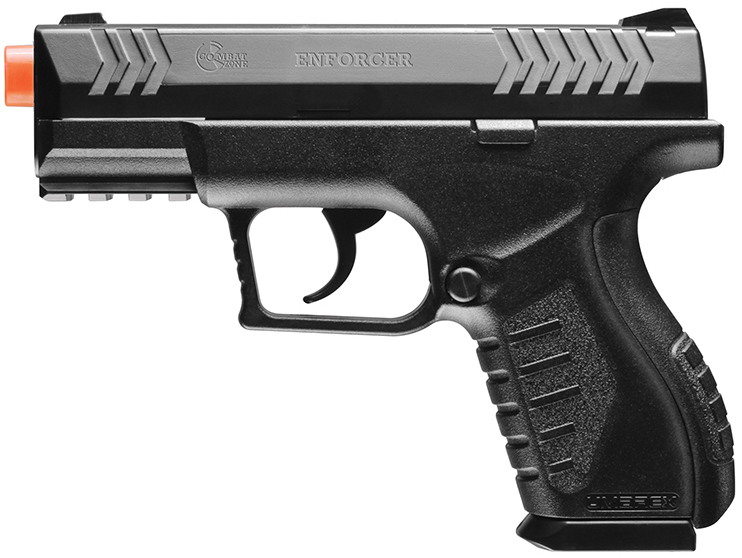 Buy the Umarex Combat Zone Enforcer CO2 Airsoft Pistol in Canada. Buy the Umarex Combat Zone Enforcer CO2 Airsoft Pistol in the US.